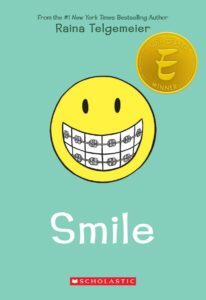 Graphic Novel Review 63/365: Smile – Scholastic Week! Today, a friend told me that he had heard that 10% of the total comics/graphic novels sold in this country were Raina Telgemeier titles. Now, I don’t know if this is true, and I did not yet research that number, but I’ll tell you what…if it is true, I’m not surprised. Raina has been delivering amazing books for years, and if you have ever read one, you know what I mean. I actually reviewed Ghosts for review 11, and you can read that review here. I hope you have scrolled to the bottom of my reviews and clicked on the links at my sign-off. I have PCC and CEO links. These are important. Why? Because in just a couple of months we will be rolling out a lending library of titles for schools to borrow from us, complete lesson guides, and we have assembled Raina’s Ghosts, Smile, and Sisters into a lit circle comprised of the three books. That’s right! You will be able to click on the site and request a free set of books for your classroom to borrow and ship back to us when you are done! We are very excited. And we hope that you are too! With a project like this, it makes no sense NOT to include this Raina trilogy. The books are fantastic, and while maybe a little young for high school, although I thoroughly enjoy them, they are prefect for the late grammar school/early middle school kids that are looking to find themselves in a world that is weird and unforgiving. 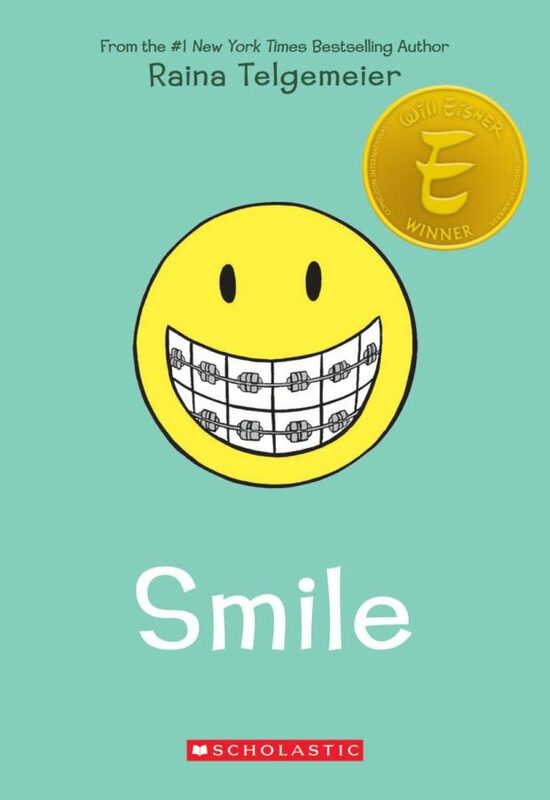 Believe it or not, I thought Smile was just OK after my first read. I know, strange, right? I don’t know why. But after I had read Ghosts and came back to Smile and Sisters, I got it. I understood the power of those two books after Ghosts. Maybe Ghosts had nothing to do with my falling in love with Smile. Maybe all of the graphic novels that I have been reading made me truly understand just how special and unique Smile is. Maybe I was just tired the first time I read it, but I’m so glad I picked it up again for the Pop Culture Classroom adventure. This book is perfect for kids coming into their own. The art is welcoming…unarrogant. The story is ours. The panel structure is simple, inviting new readers to the medium. And the cover is brilliantly constructed. I had mentioned earlier in my postings that I had met Raina randomly at the American Library Association Conference. She had the relaxed, welcoming demeanor of a middle school teacher, not a million-copy selling author, and I feel that’s another reason as to why her books are so coveted, we sense how dang cool she is from her writing because she writes her stories for us to know her, and knowing our favorite authors through their writing is getting about as close to our heroes as many of us need. I don’t need to sell you this book. It sells itself. But I will remind you to pick up your copy and read it again. And if you have not read it yet, lucky you! Go get it and explore. And let me know if I can help your classroom borrow a set sometime.